Sell passcodes to your clients and they can download your songs or collections from your own web site. They hand you cash, pay by check or pay any other way you have on your site already, Pay-pal, credit cards etc. With cash or check, you get all profits with no percentage paid to anyone else. Other payment methods are up to you. You can process credit cards and / or make use of the Pay-Pal buttons which are included in the Passcode Song Downloader package. A song preview player for each collection is included. And it runs from your site with no ads. You can release songs in MP3 192 or 320 Kbps, Flac and Wav. AAC, Org Vorbis and Alac are also available on request. You control pricing on every song and collection on every format. Flac up to masters quality and Wav files. These higher quality audio files usually sell for 50% to 100% more online. You pay for the web set up... about the cost of 40 CD sales. Remember once that is paid, everything you sell after that is all yours. The links below will open either a MP3, Flac or Wav Passcode Song Downloader pop-up. Inside each Downloader you can also switch between the three formats. You can put any of these links on your website. In other words you can access your customized Passcode Song Downloader with links on images or text. Or - You can put links to your CD's and song collections in a Song Slider, like the one below. It can be customized to size and colors and can be put anywhere on any page on your web site. Use the links above or below in the Slider, to open the Passcode example pages. Try using an incorrect passcode to see the error page. The Eyes of Ixchel - Soundtrack - Ethereal Rock soundtrack with hints of Pink Floyd... Demo with working passcodes. 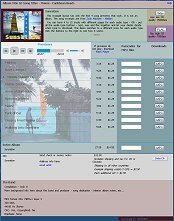 Sunsation - Caribbean Sounds - Demo with previews only - no working passcodes. Click the arrows to move the slider right or left. The first two are links go to example Passcode Song Downloaders. The other links further to the right can go to more of your CD's or any other page you request. In this example these extra links go to other music videos. The 'More Music Videos' link, upper left, is just an example. You can put any link there. The 'Your Ad Here' image, on the left, is another example. You can put any promotion there or leave it blank. Click on it to pop up a larger version of the ad. Customize your site with this album preview slider. You can change the colors and size to match your own website.